Located in middle Michigan not far from Great Lake Huron, if memory serves me right, our FH member Bob Stroud grew up getting some of HIS rock 'n roll roots listening to this station in Saginaw. This is the first of our '68 charts to feature a true psychedelic song at #1! The top 10 here is almost as diverse as could be. Psychedelia, C&W, garage, R&B, instrumentals, soul, bubblegum, pop, soundtrack hits, Brit invasion, bluegrass!!! Amazing and great to see and hear. Two of our FH stars are featured with songs that did not reach their potential hit status nationally, but managed to hit regionally all over the nation, both cashing in on the bubblegum sound. And Tommy Roe's "Dottie I Like it" got lots of airplay in the Midwest states! LOTS of Bubblegum happening here ... The 1910 Fruitgum Company, The Ohio Express and, to a degree, The Monkees, Tommy Roe, Herman's Hermits and, on this track anyway, The Troggs. I like the Orpheus debut at #31 and it's cool to see the Flatt and Scruggs Bonnie and Clyde tune charting, too. Raymond LeFevere's "Soul Coaxing" is a frequent Forgotten Hits request ... so let's feature a few of these this week. 3/5/68: Wildman Rocker Jerry Lee Lewis opens in “Catch My Soul,” a rock musical version of Shakespeare’s “Othello” in Hollywood, California. He plays the part of Iago. Also on this date, sales of “Simon Says” reach the million mark, earning The 1910 Fruitgum Company their first gold record. 3/8/68: Promoter Bill Graham opens The Fillmore East in New York City. Opening night features Albert King, Tim Buckley and Big Brother and the Holding Company. we could do something besides novelty stuff. I know you've told me before that you've considered yourself retired (or at least SEMI-retired) for the last several years now ... but it's still hard to see it in print, knowing how much joy your music has brought to so many people. But I also understand your need to stay close to home right now. I hope you'll enjoy your leisure time ... and still pop in every now and again to let us know how you're doing ... and comment on any special memories our service may inspire. So, with that thought in mind, I just wanted to let you know that we'll be featuring one of your tunes, "Dottie, I Like It" as part of our new Saturday Surveys Series, and I wondered if you might care to make a comment on it. Had you considered that maybe your time had passed after a streak of a couple of years without a hit record? “It’s Now Winters Day” was a moderate hit but didn’t really set the charts on fire. So in 1967 and '68, I was in No Hits Land and “Dottie I Like It” was my first attempt to get back on the bubble gum train which had worked so well for me in 1966. It charted but came up short. But at least I felt I was back on track with Dottie. Thanks to the bubble gum genre I created with “Sweet Pea” in 1966, I was back on the hit train with “Dizzy” and “Jam Up And Jelly Tight" in 1969. Radio here in Chicago was thrown for a loop (pun intended) this week when, after 41years as one of Chicago’s premier rock stations, WLUP (The Loop) was sold to a Christian Broadcasting Service. 41 years pushing the same format is virtually unheard of in the radio business, especially with all of the network take-overs these past few decades. The Loop was a big part of our lives growing up here in Chi-Town … Loopfest … Steve Dahl … Jonathan Brandmeier and (more recently) Mancow … Lorelei and some of the other Loop Girls … and never deviating from the concept of providing classic rock to its listeners. RIP THE LOOP. I AM BEYOND DEVASTATED! The Loop has been a part of our lives for a long, long time … but we’ve still got The Drive, The River and WXRT to fall back on … plenty on the dial for us old classic rockers. We had a couple of people send in copies of the WPGC Survey featuring The 1910 Fruitgum Company at #1 with “Simon Says.” I have since forwarded a copy to Frank Jeckell for use on the band’s website. I just watched TJ Lupinski's new PBS doo-wop show. Very interesting concept. Since the doo-wop acts are all retiring or expiring … and in order to "keep the music alive" … TJ surveyed many talented performers and put the best he could find who are still loving and performing doo-wop classics on the show. If you haven't seen it, it's worth watching. I would, however, recommend taping it so you can skip all the commercials … and there are a lot. I love the Vogues - always have. I believe their ultimate wax masterpiece remains "Magic Town," a story of broken dreams in sunny California. I play the tune all the time. The lead and high tenor are just superb. I worked a doo wop show with the Vogues about ten years. I loved "Five O'Clock World" but was sick at heart when the group omitted "Magic Town." Keep on truckin' man. There are so many of us who are proud of Kent Kotal. I'm happy to say that the Wrecking Crew Soundtrack Take 2 is closing in. We have three more weeks to reach our goal. Here's more info. The songs below are looking like our play list that we've been able to secure the rights. More are on the way. This is a 3-CD set. Two discs filled with hits and the third filled with Wrecking Crew players under their own name. One of the songs that is included is a 5th Dimension hit, "One Less Bell To Answer". One of the last interviews we pulled together before the DVD was released is with Marylyn McCoo and Billy Davis Jr. Such a wonderful couple that still tour. If you have the chance to see them live -- go! With writers like Jimmy Webb, Laura Nyro, Ashford & Simpson, Burt Bacharach and Hal David, how can you go wrong. With Bones Howe producing and Bob Alcivar as the singers' vocal arranger, the Wrecking Crew shined. The other day we ran the clip for a new McDonald’s ad running in Amsterdam featuring one of our own Chicago Radio Rock Legends, Kris Erik Stevens. Just caught the McDonalds McDrive mention in today’s Blog ... I really appreciate you running that. Thanks … very kind and very cool. In answer to your question, the gig came about via a few different recording engineers in Europe that I guess I made an impression on. I’ve traveled there frequently over the years ... and often either my Agent or a client would require my voiceover services while on holiday. Thus I’d have to find a studio and pop in to record the commercial / trailer, etc. I guess these studio guys kinda liked the way I’d pop by the studio and bang out a spot in 10 or 15 minutes and be gone! So, as the recent story goes, the Ad Agency in Amsterdam was looking for an American Voiceover talent who was also an actor for on-camera work. I auditioned ... and ‘boom,’ they called and I departed for Amsterdam in 48 hours. Fortunately, they loved my performance. It was fun, and wasn’t exactly a stretch for me to get into character! But then again, not exactly my usual day at the office. PS Love that you added my web site to the blurb ... but it was misspelled (see attached) and the link went into the ‘void” instead of to my site ... hoping you can run the correct link next time. I am saddened by the loss of Russ Solomon, the founder of Tower Records, who died last night at age 92 of a heart attack in Sacramento, Ca. One of the many joys surrounding the acclaim and kudos of my 2017 book, 1967: A Complete Rock Music History of the Summer of Love, were the fans and book buyers who thanked me for profiling Russ in the pages and devoting a sidebar to his monumental impact on the retail record business as well as our own record collections. I further realized what a destiny spot a Tower store was for thousands of people in so many U.S. cities. Tower was our little secret in California until late 1969. There was a time when the only option of getting a record was going to the record store. 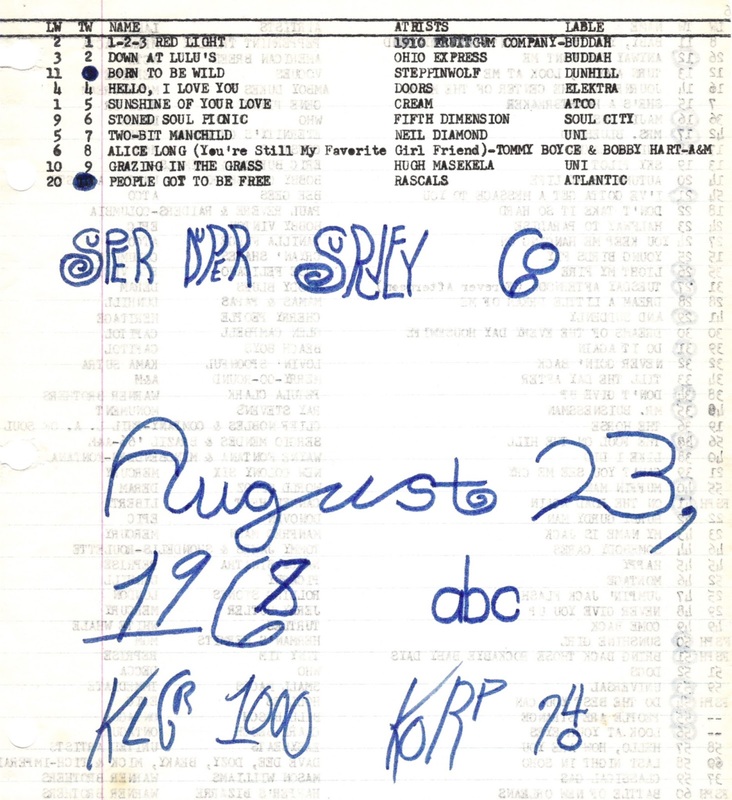 Here’s an article submitted by long-time FH Reader David Lewis … it spotlights another well-known “super fan” who built quite a legacy for himself by taping some incredible, legendary concerts back in the day. How many hours have I wasted replying to your blog site? TOO MANY! But I love it! I sit and watch the snow falling and wait to head into another ten hour day with lots of stuff to do, but when I read FH, my mind starts thinking, "Hey, I should ... “ Of course, transferring a static filled tape of mid-70's AM radio to digital always helps me. Today, listening to Landecker Boogie Check and Super CFL clippings from a very cold and snowy day in Lincoln when, like 40 years later, it's best to stay inside and listen to fave DJ's and stations of that time. ALSO, today, it's Frank from the 1910 Fruitgum Company asking for the WPGC that has spurred me on. Sometimes, I think I am Larry Neal in disguise! (Great charts, Larry!). I found my chart (amazingly) and am sending along. However, you have to take the good with the bad. You also get a couple of my personal charts from my pretend station I made from 1963 - 1976. I've always been a huge survey / radio fanatic and these charts are as important to me as Silver Dollar Surveys. Maybe more! On the WPGC chart attached, "Simon Says" does hold Paul Mauriat off the top. On MY charts, "SS" was never #1 due to "Lady Madonna" holding it off at #2 in March, 68. The ONE 1910 45 that reached #1 on my KLGR chart was "123 Red Light," which held off the group's main bubblegum competitors, the Ohio Express' "Down at Lulu's" which would reach #1 shortly thereafter. It was a top 60 featuring, of course, several Chicago artists, but have attached just Page 1. 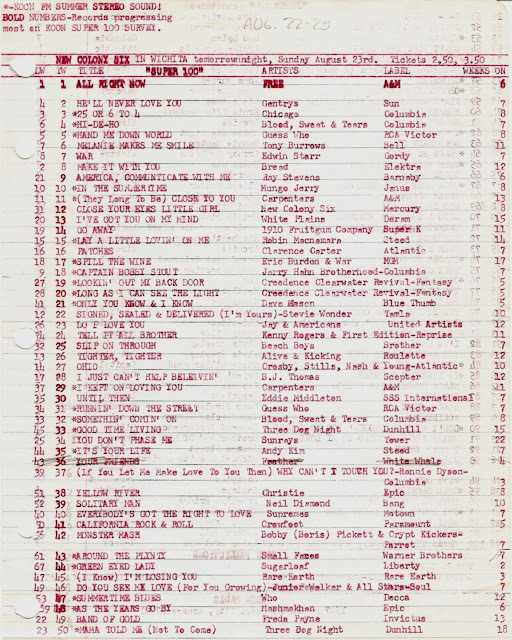 More interesting may be the story behind the 1970 1910 45 "Go Away" reaching #14 on my top 100 chart in August of that year. HOW did a kid in Dodge City, Kansas, ever hear this 45 when it did nothing nationally? Well, it was because I was recording it off American Bandstand's "Rate-A-Record" segment! I liked it and in the late 70's, I was happy to track down the 45 and add it to my collection. #1 All Right Now was a 7 week #1 record, making it the longest running record EVER on my years of chart making! #2 The Gentrys were on a hot streak on my charts: Four consecutive #1's from the 69 - 70 era. #25 Beach Boy fan Phil might enjoy seeing the great "Slip On Through" rising to #25 this week. #29 Kris Erik Stevens might enjoy seeing me feature Richard Carpenter's B side "I Kept On Loving You" charting when the band was just a 2-hit wonder at the time. Kris released his own 45 version of this later on. #31 Burton Cummings' great B sides always did well on my chart. They were almost ALL "Two sided winners" to me! "Bus Rider" reached #2! #41 Crowfoot was a Canadian band that I heard thru "Rate-a-Record" as well back then! #43 Rod Stewart's new gig and first as a Small Face. This was charting well mostly on how cool the STEREO was on this 45! 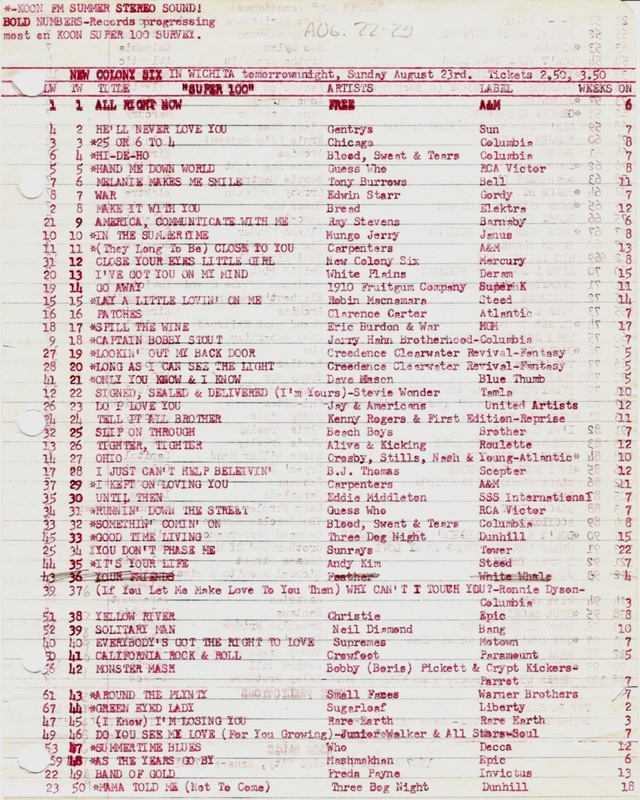 #34 HOW is this 1965 B side charting five years later? Well, I had just bought the Sunrays 65 Tower LP on a mono clearance and fell in love with the song! HEY, it was my chart, my station! And there were 50 more songs on the back side!!!! BTW, Art Vuolo radio videos really ROCK! Some of the best things anyone can watch if you are a radio geek. Also, Larry Neal's survey signed by Joe Niagara is great! He was a radio legend! As was WLS' Kris Erik Stevens!!! I really liked your posting of John's rock 'n' roll crayon colors. Now what goes with crayons? Why, a COLORING BOOK of course. Just ask Sandy Stewart and Kitty Kallen. New York: Author Mark Bego, tub-thumping his Eat Like A Rock Star best-seller on the West Coast, attended, with his co-author Mary Wilson of The Supremes, Elton John’s 26th Academy Awards viewing party, which raised $5.9 million for his AIDS Foundation Sunday night in West Hollywood. Oscar Event.